More than any other cooking task during the holidays, pie — and pie dough in particular — seems to strike the most fear in home cooks. And we get it. There's something about pastry that seems mysterious and often intimidating, but we're here to help you overcome that urge to head to the freezer aisle come pie-time. No matter what type of pie (or pies) you're baking this holiday season, we've got you covered, in as much detail as we can muster. And if you have any more questions, scroll down to the bottom of the story — we'll show you how to get answers. The best pie crust of your life is only a few sticks of butter away. If you've never made pie dough from scratch before, never fear. It's actually not hard at all, as long as you've chosen the right recipe. Our cream cheese pie dough takes all the guesswork out of pastry by substituting cream cheese for additional liquid. This makes it virtually impossible to overwork the dough and adds a tangy richness to the final baked crust. Even better? The dough itself is easier to roll out than Play-Doh and doesn't even need flour on the counter to prevent sticking. And if you're really nervous about rolling? You could even press the dough into the bottom of your pie plate. This cream cheese dough will work great with any pie filling you'd like, but it is particulary useful for anything ooey and gooey, such as pecan or buttermilk pie. Because the dough is made to be tender, not flaky, there won't be any risk of rips, tears and leaks formed from large pieces of butter. None of that sweet and delicious filling will leak through and stick on the pie plate, plus the fully baked crust is ultra-easy to slice. All-butter crust, while slightly more finicky, is also not out of reach for the beginner. The most important thing to remember when you're making flaky crust is to keep everything cold — ice cold. Before you even start thinking about cutting butter into flour, place all of your bowls, tools and ingedients in the freezer. Yes, even your flour. The colder everything is, the less likely the butter will melt and smear into the flour, which is the number one cause of chewy, gummy pie crust. Next, use your hands (or a pastry cutter, if you must) to quickly, but effectively, work the butter into the flour. I like to start with 1/4-inch (or so) cubes of butter and then rub them into discs in the flour. Some pieces of butter will more fully incorporate into the flour than others, and that's a good thing: The aim of this step is to incorporate the butter in both big flakes and in little crumbled bits that get more fully worked into the flour and help structure. Once you see a mix of rough meal and big flakes, you're ready to add liquid. Remember when I said to keep all of the ingredients ice cold? 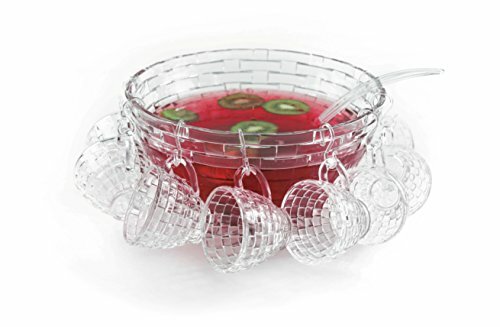 After you stick everything in the freezer to chill, fill a liquid measuring cup with ice water. Let this sit and get frosty cold while you get that butter worked in. This will be the stuff that takes your mixture from buttery meal to flaky pie dough. My favorite way to incorporate this ice water is to pull out a rubber spatula, and to fold and smear (not stir) the water in. I'll drizzle in about two tablespoons of water (measure if this is your first time making all-butter dough) and then use that spatula to fold and smear, fold and smear. This technique sort of replicates another style of mixing pastry, called frissage. (You'll most often see the word "frissage" in recipes for "rough" puff pastry. (Shoutout to the Great British Baking Show.) Basically, this mixing technique creates even more flaky layers of butter, while developing the minimal gluten structure needed to hold the dough together. Once those first two tablespoons of water are incorprated, continue to drizzle, fold and smear in more water, one tablespoon at a time, until your mixture looks almost like pie dough. There may be some dry-ish bits, but if you squeeze them together between your fingers, they should hold together. 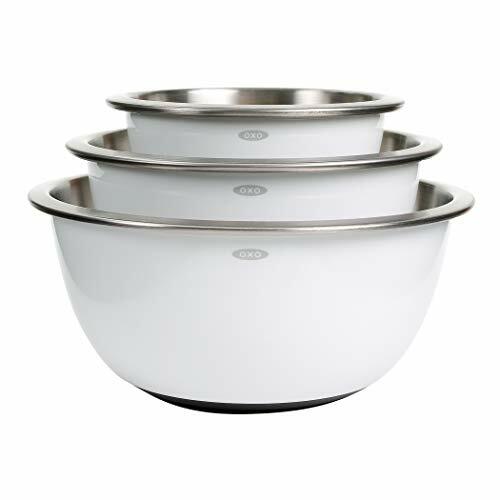 For a single-crust recipe, this will take something like 1/4 cup of water; double-crust recipes will require closer to six or even eight tablespoons. Turn the dough out onto a lightly floured countertop and fold the dough over a couple of times to form a solid round. You should be able to see some of the pieces of butter in there. Now, stick it in the fridge and forget about it for at least an hour. The flour needs this time to absorb the liquid from both the water and the butter, and the butter needs a chance to cool back down again before you roll it out. Rolling out all-butter pie crust will require flour on the counter, and I recommend that you not be shy here. You can always brush off excess flour that's visible on the outside of the dough round, and you really don't want to waste your morning scraping off dough from your countertop, do you? If your dough is super-cold (say, it's been in the fidge for a full day or two), you'll want to give it some good whacks with your rolling pin. This step will soften up the butter a bit and make it easier to roll without cracking. Consider it your pre-Thanksgiving dinner therapy. Pound it out until the round is around 1/2 inch thick, and then you can start to roll. I like to roll the dough out gradually; give it a spin or two under the rolling pin and then rotate the dough a quarter-turn. If it's already sticking, throw a little more flour underneath it. Roll again, and give it another quarter turn. Repeat this rolling and turning step, adding more flour as needed, until the dough is somewhere between 10 and 12 inches across. To move it to the pie plate, fold the dough in half, and then fold that in half again, so you have a fat pizza slice of dough. Place that slice in your pie plate, with the pointy tip smack dab in the center. Then unfold the dough and gently drape it into the edges of the pie plate. Be careful not to strech the dough out during this step; you should have enough extra dough that you can gently press it into the bottom and sides. Next, trim off any excess dough, leaving about 1 inch of overhang along the edges. 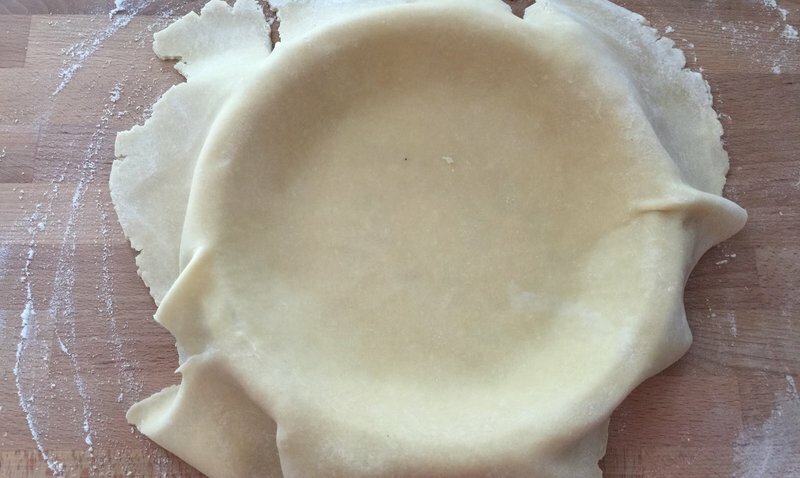 If you've got a preferred crimping technique, feel free to use it here, or follow my example for an easy, professional finish: Fold that excess dough under itself so that the edge of the dough is double-thick and comes just to the rim of the pie plate. Use the two fingers of your dominant hand and one finger on your other hand to start molding the edge of the dough into a v-shape. The action should feel kind of like you're sticking one finger in between two pinching fingers. Continue to do this all the way around the edge of the pie. 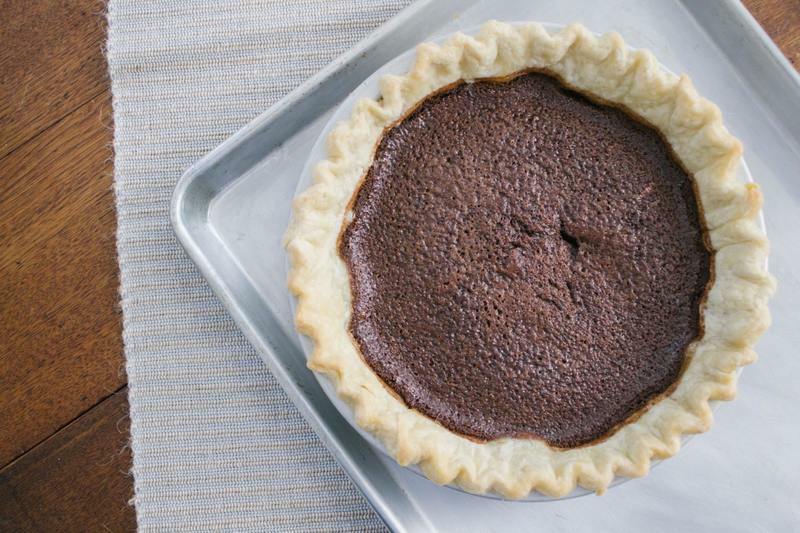 If you're new to pie baking, you'll likely be utterly confused about blind baking. All it means, though, is to pre-cook the crust a bit before adding your fillings. This step is particularly useful for very loose and liquidy fillings, such as pumpkin, as well as for pies that don't need to bake very long. Loose fillings need a bit more of a barrier than raw pie dough can provide; they tend to seep into the bottom layer of crust, creating what's known as a "soggy bottom" (shoutout to Mary Berry). Quicker cooking pies, such as chess and buttermilk pie, aren't usually in the oven long enough to cook the pastry to its crisp, browned glory, so the crust needs a bit of a head-start. On the other hand, pies with a sturdy fruit filling, such as apple, or those that cook for quite a while at a lower temperature, such as pecan, don't need a blind-baked crust. Those'll be just fine without this step. Double-crust and lattice-topped pies, likewise, are not blind baked, as it is difficult to get that top layer to adhere to a partially-baked bottom crust. If you've decided you need to blind bake, simply cut a large piece of parchment paper and press it on top of the crust in the pie plate. Now fill the plate to the brim with heavy pie weights. 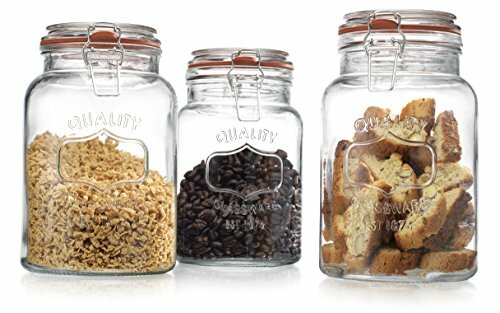 You can certainly use official pie weights here, but pantry staples, such as rice and dried beans, work just as well and are far cheaper. (You'll likely want to reserve these as pie-only rice or beans afterwards, though.) Spread out your weights evenly across the crust and pop the whole thing in a 350- to 375-degree oven for 10 minutes. At this point, the crust will still be very pale, but will start to look set. Very carefully remove the hot pie weights by pulling up on the edges of the parchment paper. Stick the weight-free crust back in the oven, to continue to bake for another five minutes. You'll see the teensiest bit of browning around the edges. Congratulations! You've successfully blind baked! Let the crust cool completely before adding your filling. No matter your crust, and no matter your filling, one of the best ways to ensure that your pie comes out of the oven looking as pretty as it did going in is to bake it on a sheet pan. Not only is it far, far easier to pull a hot sheet pan out of the oven than a shallow, round pie plate, the sheet pan will also catch any bubbling filling or leaking butter (we've all been there) before it hits the bottom of the oven. There's nothing worse than turning on your oven to roast your turkey, only to be greeted with the acrid smell of burnt sugar and butter. And with that, we'll turn you loose to bake up a frenzy. Is there anything else you're dying to ask about pie baking? No question is a bad one, and we're here to help. 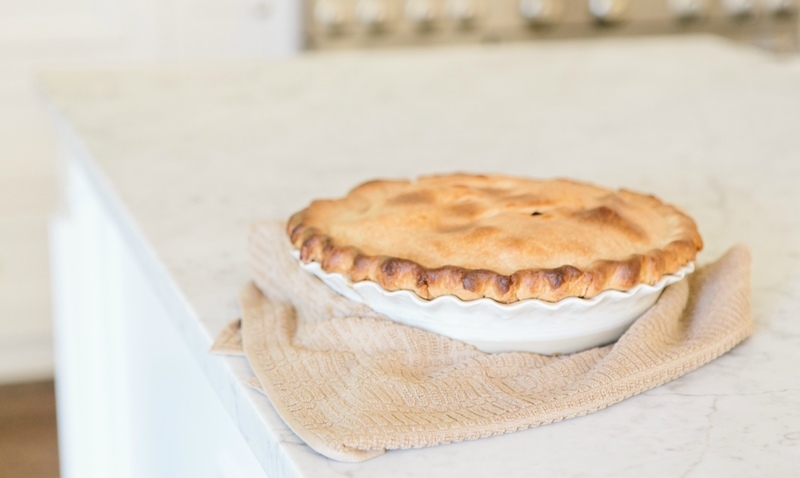 Send all of your pie queries to kate@southernkitchen.com, and I'll be sure to answer them while I'm in the kitchen, baking my own.